Finance minister Arun Jaitley. Photo: Pradeep Gaur/Mint. New Delhi/Mumbai The government’s decision on Monday to merge three banks it owns—Bank of Baroda, Dena Bank and Vijaya Bank—is expected to reduce the amount of capital it needs to pump into these lenders and help clean their balance sheets. The merged entity, comprising two relatively stronger banks and a weak one, will be the third-largest lender in India after State Bank of India and HDFC Bank Ltd, with a total business of more than ₹ 14.82 trillion. Finance minister Arun Jaitley said the government had been careful in not merging weak banks. “Two strong banks can absorb a third bank to create a globally competitive bank, he said. “No employee will face any adverse service conditions after the amalgamation." In October, the government set up an alternative mechanism comprising Jaitley, defence minister Nirmala Sitharaman and railways and coal minister Piyush Goyal, as an approval framework for proposals to merge state-run banks. 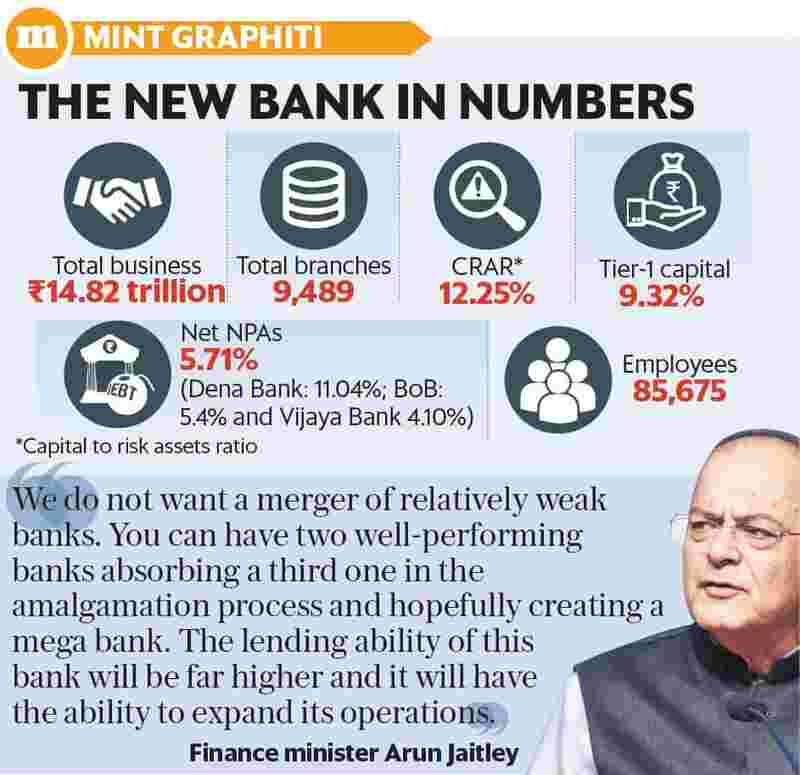 “Under the mechanism, Jaitley has advised the boards of the three banks to consider the proposal," financial services secretary Rajeev Kumar said, adding that it was the next logical step in strengthening the banking system. One of the reasons behind the choice of these banks was perhaps the fact that all three use the same core banking system—Finacle from Infosys—making the task of merging the technology platforms and back-ends relatively easier. This is the third major restructuring in the public sector banking space undertaken by this government. The first was the merger of the five associate banks of SBI with itself. The merger had resulted in a sharp jump in the combined entity’s bad loans portfolio, crimping its profit. The associate banks made a loss of ₹ 5,792 crore for the March quarter of 2016-17 and ₹ 10,243 crore for the entire year. This resulted in the consolidated net profit of SBI going down to a mere ₹ 241 crore when the stand-alone net profit was ₹ 10,484 crore. The government is now looking to offload its majority stake in IDBI Bank to Life Insurance Corp. of India. The transaction is in the process of obtaining approvals from regulators and other authorities. Individual boards of each of the three banks will have to approve the merger. The name of the merged entity is also likely to be decided later. What also needs to be seen is whether the merger will be effective in wiping out the mountain of bad loans that currently weighs down the performance of almost all public sector banks. It would also be interesting to observe whether the government extends the same strategy to other ailing public sector banks. Bank unions were quick to oppose the merger. Calling it unwarranted, they said it was the government’s diversionary tactic to take the focus away from the huge levels of bad loans. “There is no evidence that merger of banks would strengthen the banks or make it more efficient. We have seen the example of five associate banks merging with SBI. No miracle has happened," All India Bank Employees’ Association said in a statement. “On the other hand, it has resulted in closure of branches, increase in bad loans, reduction of staff, reduction in business, etc. For the first time in 200 years, SBI has gone into a loss." Analysts were critical as well. “This merger is negative for Bank of Baroda and Vijaya Bank. The merger has to go through parliamentary approval, which will be a critical factor considering general elections are slated for next year," said Ashutosh Mishra, an analyst at Reliance Securities Ltd. While Dena Bank has been placed under the prompt corrective action (PCA) framework by the Reserve Bank of India, with restrictions on lending, Vijaya Bank is among the only two lenders to have reported a profit in 2017-18. As a percentage of total assets, Dena Bank has the highest gross non-performing assets at 22.04%, while Vijaya Bank has 6.34% and Bank of Baroda 12.26%. P.S. Jayakumar, managing director and CEO of Bank of Baroda, said the merger would result in greater presence in the four southern states. “Dena Bank customers will no longer be covered under PCA as the consolidated entity has adequate capital to scale its business. But before all this, there is a need for a board approval. There are also a number of legal steps to be done," he said. Dena Bank’s capital adequacy ratio stood at 10.6% on 30 June 2018, Vijaya Bank’s at 13.91% and Bank of Baroda’s at 12.13%. The combined entity’s capital adequacy rating will be at 12.25% with Tier-1 capital at 9.32% and net NPAs at 5.71%. The branch network of the combined entity will be nearly 9,500. Currently, 11 of the 21 PSU banks are under PCA, with some being placed under restricted lending. “On the timeframe, I do not know how long it will take but if you go by past practices and the experiences that are there, it would probably take 4-6 months," Jayakumar said. According to Kumar, there is no need for amending the Bank Nationalisation Act, adding that the scheme of amalgamation will be tabled in Parliament. On Monday, Shares of Bank of Baroda rose 0.41% to ₹ 135.10 on BSE, Dena Bank fell 0.6% to ₹ 15.95 while Vijaya Bank rose 1% to ₹ 59.80.